To some, Beyoncé is the epitome of feminism. On the surface, Mrs. Beyoncé Knowles-Carter seems like a great role model. She is an extremely talented performer and a hugely successful artist who sings about empowerment and self-confidence. Indeed, many claim that she has created a new wave of feminism appropriately called “Beyoncé Feminism,” which one student from the University of Warwick even wrote her final undergraduate sociology dissertation about. If you ask me, this student chose a poor paragon. Beyoncé is not at all a good representation of a feminist. After thinking critically about the ways she exploits her personal affairs and how she brands her feminist image, I don’t think she is someone people should be calling an icon of the feminist movement. To me, the way she brands herself as a feminist diminishes the entire movement. I believe that the kind of feminism she represents is what is known as commercial or celebrity feminism. This branch of feminism is used to promote one’s image and brand in an attempt to increase product sales, and it is not empowering. In 2014, Beyoncé did a performance at the MTV Video Music Awards (VMAs) of her song “Flawless” where at the end, the word “FEMINIST” lit up behind her. People all over social media applauded her for it. However, I feel the reason she decided to brand herself a feminist in this way was not merely to make people aware of inequality or to educate, but rather as a way to promote her brand and make money off the movement. I mean, could there be a more obvious or one-dimensional way to announce that you’re a feminist than by displaying it in huge letters? I don’t think so. It reeks of slacktivism to me. I think her reason for presenting herself as a feminist is no more than a good marketing scheme. The goal of most artists, actors, and other celebrities is ultimately to push their brand, their product, and to make money—so presenting an image of female empowerment at a televised event viewed by many young, impressionable teen girls is a great way to promote one’s “feminist” brand, no? I think that by associating herself and her brand with the term, Beyoncé essentially brought feminism back into the mainstream and into the consumer market. 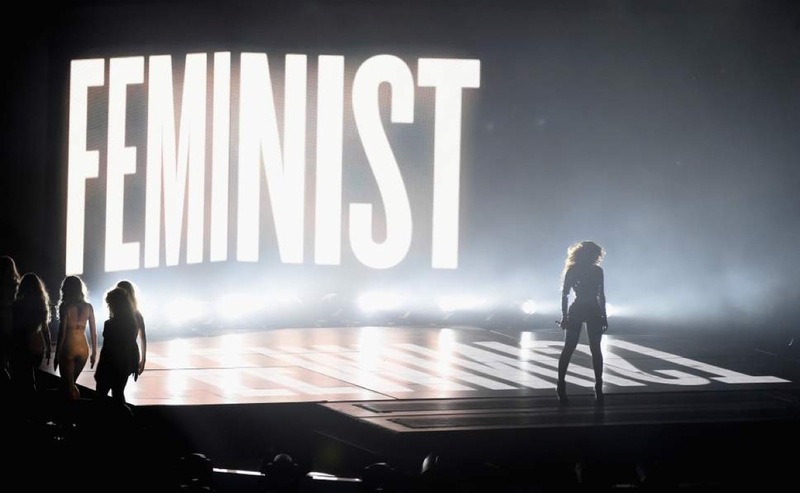 Advertising feminism at an event like the VMAs, she made the word “feminist” seem not so scary anymore. What was formerly regarded as an extreme political ideology now had support from one of the biggest female celebrities of our time. I think as a result it’s become a fashion trend, and now her and all of her songs are associated with the movement, further solidifying her position at the top of the feminist market and increasing her product sales. Another reason I disagree with her feminist façade is the basis of her most recent album Lemonade. In the album, she sings about the affair of her famous rapper husband Jay-Z. Many fans regarded this as an iconic moment for women and feminism, but I thought it was a cheap gimmick and a great way to exploit her personal affairs and her strong feminist image for album sales, which is not what I would describe as empowering. On top of that, she decided to stay with her husband after he cheated on her. You could say it’s a testament to what a strong woman she is, but I think her reasons for doing so are only to keep up appearances and to continue to be the biggest celebrity couple in the entertainment industry. I also vehemently disagree with the idea that it is somehow feminist to stay with your husband after he had an affair, even if you do make a successful album and loads of money out of it, but that’s just my opinion and a separate discussion. Many people out there who are doing a lot for women’s rights and equality are more deserving of the “feminist icon” label. Just because Beyoncé sings songs about girls running the world, includes lyrics about being flawless, and uses the word in her performances, it does not mean she deserves the title. Being a celebrity is largely about cultivating an image and making money—so think carefully about that when deciding who you look up to in the feminist movement.